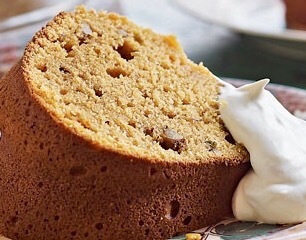 This wonderful and savory combination make for a more interesting and sophisticated pumpkin cake. Finish off slices with some maple syrup sweetened crème fraîche. I love a good Minnesota Bundt cake! And this one pairs well with a good smoky Scotch, which is unusual in a Bundt cake. Preheat the oven to 375ºF. Grease a 12-cup Bundt pan and dust with flour. Combine the butter and sage in a small pan and heat on low until the butter is melted. Set aside to cool. Whisk together the flour, baking powder, ginger, and salt in a medium mixing bowl. Whisk together the butter and sage mixture, granulated sugar, brown sugar, pumpkin, eggs, and vanilla in a large mixing bowl. Stir the flour into the pumpkin mixture until combined. Stir in the chopped nuts. Scrape the batter into the prepared pan. Bake until a toothpick inserted in the center comes out clean, 40 to 45 minutes. Let cool in the pan for 5 minutes, then invert it onto a wire rack to cool completely. Slice and serve.